We love hummus, but we don't always have the time to make it ourselves. Here's a tip to raise your store bought hummus to the next level! Hummus has quickly become one of America's favorite snack foods. Hummus is high in nutrition, protein and of course, flavor! When serving hummus, we recommend transferring it to a bowl, making an indentation or two at the top and drizzling it with extra virgin olive oil. The oil will make the hummus taste richer and creamier and will add complexity to the flavor of the hummus. Fresh herbs or a sprinkle of paprika will also make the hummus more delicious. Serve with pita chips and enjoy! A note on oils: Most major brands of hummus are made with soybean or canola oil. 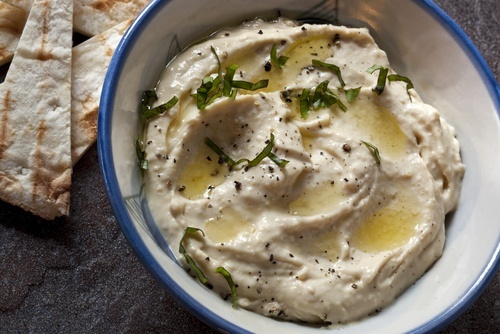 Consumers looking to avoid those oils should look for hummus made with tahini as the only fat. Most brands of pita chips are also made with soybean and canola oils. Check out this easy recipe for pita chips made with olive oil.